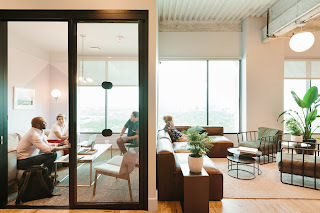 Co-working space, flexible offices, hot-desking, shared-open offices, communal office space – just a few buzzwords used to describe the latest trend to hit the office market that is appealing to tenants such as freelancers and startups because it provides flexible workspace and flexible lease terms. It’s also beneficial to larger companies in terms of “swing” space, providing easy options for the companies to ramp up or downsize, as needed. As the momentum continues, co-working companies will ultimately compete for supremacy. They will take on more space than demand warrants -- which may lead to a collapse, leaving a few survivors. Building owners need to be cautious about having too much exposure to co-working locations as tenants. The new buzzwords are gathering a lot of attention, but the concept has been around for quite some time. Long before WeWork, there was Regus, which has an executive suite setup. Today’s co-working companies are a modernized version with upgrades and nuances that create a more collaborative work place. Regus had a successful run in the late 1990s, alongside the dotcom boom. (We all know how that ended.) It eventually fell victim to the economic downturn and was left with an over-supply of office space and was forced into Chapter 11. However, Regus (now IWG) survived and remains in business today with more than 40 locations in the Houston area and the largest flexible space provider in the country. Do today’s co-working companies have long-term staying power? Can they survive an economic downturn? There are an estimated 100-plus flexible working space companies in Houston that likely make up less than 1% of total office space inventory. Given the undersaturated market, there is potential for growth in the Bayou City. WeWork has two locations with a combined estimated 142,000 sf. Other newcomers include Reth!nk, slated to open its 42,000-sf space in Houston’s Midtown Arts District in spring 2019. Austin-based FirmSpace will take up 2 floors at 2200 Post Oak Boulevard for a total of 32,872 sf by the end of 2018, and Work Well, opened by Houston-based development company Caldwell Cos., has 23,000 sf at 13100 Wortham Center Drive in northwest Houston. Whether the flexible space trend will continue to accelerate and assimilate into the office market landscape remains to be seen. Landlords may still want to take a cautious approach to making long-term investments with co-working companies. As with most new ventures, there is fierce competition within the market to rise to the top. There were winners and losers from the dotcom bust of the 1990s. Survivors that continue to thrive include Amazon, Priceline and Ebay. Will WeWork and Regus continue to dominate the co-working industry? We shall see.